Cut a baguette into 1-inch-thick slices and brown on a grill. Cut up large cherry tomatoes and lay out on a heavy-bottomed skillet. Drizzle olive oil over the pieces and brown for 8 to 10 minutes. 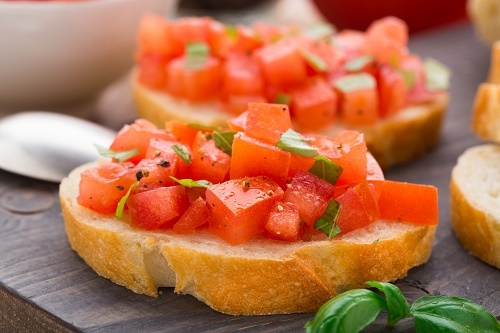 With the main ingredients ready, all you need to do is to assemble your bruschetta. You can set out crumbled ricotta cheese and basil as garnish and salt and pepper for seasoning.